I was really worried about doing well in college algebra, and my type-A personality and a bit of anxiety took over. While there at the public library, I ran into Tonya and a high school friend of hers who were perusing wedding magazines in preparation for her friend’s wedding. I spoke briefly with them both and asked for their phone numbers (really just wanting Tonya’s). A few days later I called her, and this began a wonderful friendship and a dating period of four years. So in essence, a summer library trip after high school has led to 26 wonderful years of marriage and 8 beautiful children – how do you like that math! RRJ: What qualities did your spouse possess that made you think he/she was someone special? 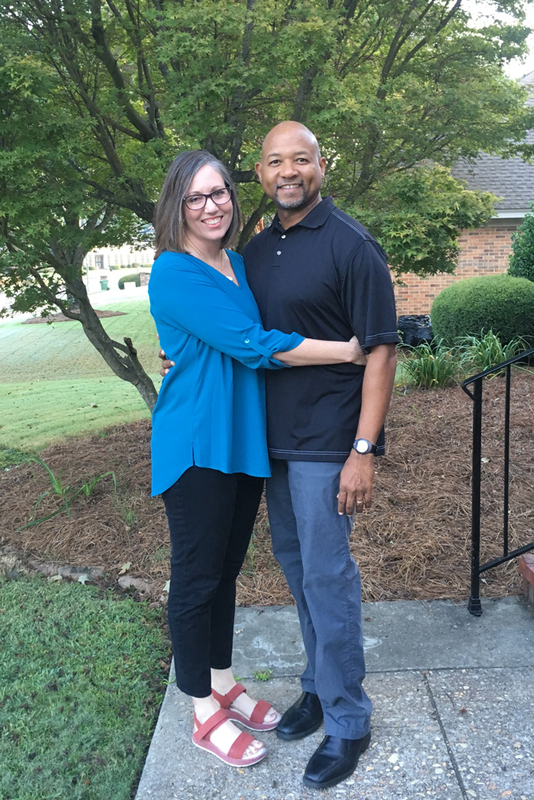 Jean-Noel: Early on in our dating relationship, I appreciated Tonya’s down-to earth personality, incredible work ethic, and her genuine interest in reaching out to people who are often times viewed as outside of the popular social circles. While these qualities still exist, they are now coupled with my appreciation for her deep passion to know and live for Christ, and unwavering commitment to turn the hearts of our children to Christ in all that she does. Tonya: In Jean-Noel, I saw an overwhelming level of optimism even though life had not been easy. He worked diligently, particularly in areas that were not his strong suit, like algebra. He, too, noticed the folks who might be a bit ‘different’. Jean-Noel had a humility to put others first and found ways to see them succeed. He’s a natural born peacemaker and diplomat. Lastly, Jean-Noel is much more extroverted than me, which to an introvert-extraordinaire is quite attractive. RRJ: Were you both followers of Christ when you met? Tonya: Jean-Noel was baptized at age 14 and he and his family were active members of their church. My childhood religious experience was wrought with misleading and disingenuous images of God, which left me highly suspicious of any attempts of others to evangelize me. At the time we were dating, I was sincerely seeking who Christ was, yet was not engaged in a spiritual community or church family. This reality initially caused some tension in the relationship with Jean-Noel’s parents. My openness to a genuine, no-strings-attached Bible study through a mentor of Jean-Noel’s resulted in spiritual marriage counseling for us both, and ultimately I chose to take on Christ through baptism several years after we were married. RRJ: Tonya, because of your journey, how important is it to you to have a community of believers in your life? Tonya: I remember the desperate prayer at the beginning of our marriage to not repeat the past. I knew I couldn’t rely on instinct. I needed godly examples to walk this walk of faith. Looking back, I can see how faithful God was to my plea. Perhaps, this is why we moved so much (Alabama is our sixth state). God showed us generational faithfulness in church families. He showed us good parenting. God showed us ‘family’ in a larger context, and how we need to rely on and be relied upon by a faith community. We are not meant to walk this walk on our own. RRJ: With Jean-Noel’s job as vice president for student services at Faulkner University and your job managing the household and home educating your children, your plates are full! What challenges does that bring into your marriage and how does your faith guide you towards practical solutions? Tonya: Yes, caring for and educating eight children at home for me, and addressing the needs of hundreds of college students and staff on a daily basis for Jean-Noel, certainly challenges our ability to nurture our relationship with one another. If we are not careful, we can find ourselves running in two separate circles or separate worlds – thus missing the necessity to spend time with one another and to operate as one in God’s design for marriage. We have learned that we MUST be highly intentional in creating opportunities for the two of us to spend time together alone. To aid in this, we start each morning off quite early together, and without all the other distractions, with what we call our coffee and prayer time. We pray together, encourage one another, assess the needs of each of our children (young and young-adult), and talk about how we can encourage their hearts and minds toward God. We also try to find affordable opportunities to get away together for a few days to wind down a bit, enjoy one another’s company, and to explore how we are doing in our marriage. These retreats always bless us beyond what we can imagine. RRJ: How intentional are you about allowing your children to see into your marriage and to learn from you two? Thompsons: In an age where marriage is becoming less respected and less desired, we place an even higher value on God’s design for this covenant relationship and the family unit. As such, we try to show our children the true blessings a godly marriage can bring. We stress that a marriage relationship is not always rosy and takes much work, selflessness, and faith to sustain and grow it. Loving and respecting each other before our children is perhaps the best thing we can do to bless them in their future marriages and family aspirations. RRJ: What do you think your children will remember about your faith when they are grown? Thompsons: Our hope is that they see fallen people, daily in need of redemption. We hope they take this baton of faith and refine their own lives, and that they have had an example (although imperfect) of courage to step out of the norm to further reflect Christ. RRJ: What are some key resources you rely on to continue honoring Christ in your home? Thompsons: Continual prayer and Bible reading is paramount. Reading tons of books on child-rearing and marriage has been extremely helpful as well. It is important to put these resources through the biblical sieve, with a willingness to think critically about where the authors honor biblical truth and where they do not. We recommend reading and listening to things that challenge you versus just those things that keep one in a happy place. Specifically, we recommend reading Shepherding a Child’s Heart, by Tedd Tripp. Another challenging and helpful read is Family-Driven Faith, by Voddie Baucham. RRJ: For fun, what three things do you each think you have in common? Thompsons: First, we both have a strong desire to break the cycle of brokenness we have experienced in our respective extended families. We both enjoy fine arts and music. Third, we both enjoy outside activities like hiking and gardening. RRJ: Finally, since this is our Wedding and Marriage Issue, many couples just starting out will be reading this interview. What’s one piece of advice you two would want to give them? Thompsons: While it is fun and good to dream together about what your lives will be as a couple, be sure to spend ample time prior to marriage truly discerning what God loves and how you can center your marriage around these things. Said another way – we often get fixated on the “picture” of married life (what house we will have, number and type of kids) and not enough on God’s “purpose” of married life (to love and honor one another, foster generations of faithful children, and serve and bless others in the world). Jean-Noel and Tonya Thompson have eight children: Tatyana (23), Dyani (20), Nizhoni (18), Ediah (13), Anlon (9), Simeon (8), Sasona (5), and Zadok (3). Read 594 times	| Like this? Tweet it to your followers!